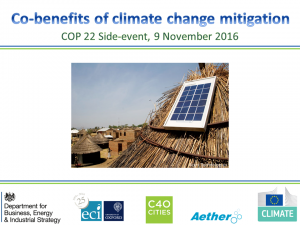 As co-benefits continue to rise up the political agenda, there will be three side-events on this theme at COP 22 in Marrakech. Wednesday 9 November, 10.30am-12.00, EU Pavilion, Bratislava Room. 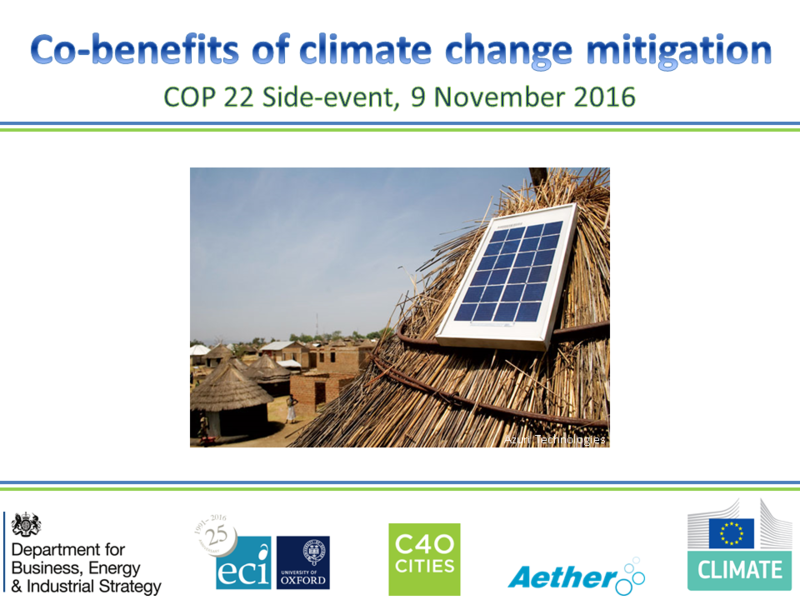 This side-event will highlight the substantial potential for climate action to generate co-benefits for other objectives. It will present evidence that the value of these benefits, for example in avoided healthcare costs or fuel savings, can exceed the cost of climate mitigation, so that climate action can pay for itself. This can be a powerful motivation for countries to increase the ambition of their NDCs (nationally determined contributions), which are currently not adequate to meet the long term temperature goal set in Paris. Equally, possible adverse effects of some mitigation actions can act as barriers to action. Well-designed, integrated policymaking can maximise the co-benefits and minimise any adverse side-effects. • Provide a platform for delegates from other countries to share their ideas about implementing integrated approaches . The New Climate Institute are organizing this event to highlight the Missed Co-benefits of INDCs for fossil fuel imports, air pollution and jobs. If you will be at COP 22 you are very welcome to come to these events, and please also help to spread the word. This entry was posted in Energy security on 2nd November 2016 by Admin. Maximising renewable power generation could lead to substantial co-benefits from reduced mercury pollution, according to a new study. The main source of mercury emissions in Europe is coal-fired power stations, which contribute about 60% of the total. Mercury is deposited onto land and then washed into rivers and lakes, entering the human food chain after accumulating in fish and seafood. It is highly toxic, causing damage to the brain and nervous system, especially in unborn children. Growing evidence of the harmful effects of mercury led to the adoption of the Minamata Convention on Mercury in January 2013 – a global treaty to control mercury emissions from gold mining, power stations and industry, and ban the use of mercury in many products. The study, led by IIASA, looked at two future scenarios for Europe – a baseline, with no change from current policies on renewable energy or greenhouse gas emissions, and a Maximum Renewables scenario. Both scenarios assume that all currently planned air quality legislation is enacted. Under the baseline scenario, energy demand grows by 7% from 2005 to 2050, and the share of renewable energy grows from 6% to 16%. In the Maximum Renewables scenario, energy demand falls (due to efficiency measures) and the share of renewable energy grows to 58% in EU countries and 46% in non-EU European countries. Electricity generation is almost carbon-free, helped by imported solar power from North Africa which meets almost a quarter of electricity demand. In the Maximum Renewables scenario, mercury emissions in 2050 fall by a third, from 145 tonnes in the baseline to around 100 tonnes. The cumulative saving from 2005 to 2050 is 1200 tonnes, with 63% of these savings being due to the increased share of renewable energy (displacing coal), and the rest being from increased efficiency and other changes in industrial activity. 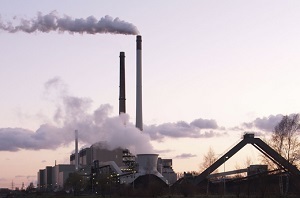 Mercury emissions from combustion of biomass and waste are expected to increase slightly, but this is far outweighed by the emission cuts from burning less coal. As would be expected, the co-benefits are greater for countries that are highly dependent on coal-fired power generation, including Poland, Germany and Turkey. But much of the mercury deposited in Europe comes from outside the continent, so the paper concludes with a reminder that action is needed at a global level, not just in Europe. This entry was posted in Air quality and tagged air quality, climate policy, co-benefits, coal, health, mercury, pollution on 7th March 2015 by Admin. A wide-ranging review has found that meeting carbon targets in the UK will provide at least £85 billion in health and environmental co-benefits up to 2030. The report considered the impacts of action to meet the UK’s fourth carbon budget, for the period 2023-27. This is a step on the path towards cutting carbon emissions by 80% by 2050 (from 1990 levels). After an extensive review of existing studies and literature, the consultants identified a wide range of both positive and negative impacts, which were quantified where possible. The results are quite surprising. As expected, positive impacts (co-benefits) include the air quality benefits of reduced fossil fuel combustion. The health benefit of reduced exposure to fine particle (PM2.5) pollution was estimated as around £1 billion per year in 2030. Yet even greater benefits arise from a shift to healthier lifestyles. 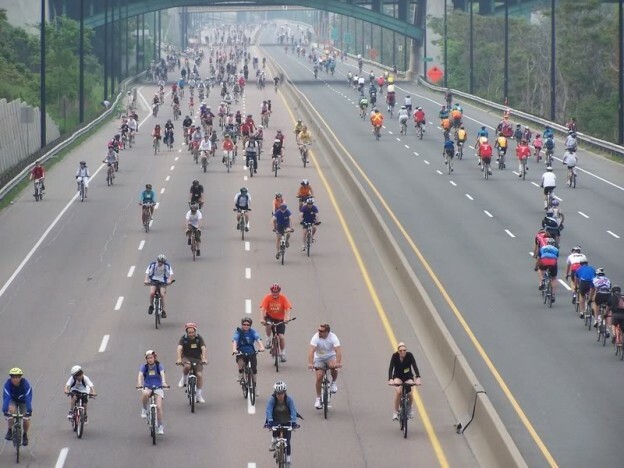 The health benefits of walking and cycling instead of driving are estimated as £2.3 billion in 2030, reflecting the importance of active lifestyles in reducing chronic illnesses such as heart disease and diabetes. There are even greater benefits through cutting traffic congestion, saving £8.4 billion in lost time. Some negative impacts were also identified, including waste disposal and accident risk for nuclear power. The total impacts that were quantified reached around £13 billion per year by 2030, with a net present value of £85 billion over the period 2008 to 2030 (at an annual discount rate of 3.5%). However, the researchers stress that this is an incomplete estimate as not all impacts could be quantified. An extra scenario in which consumption of meat and dairy produce was halved was also evaluated. This produced health benefits worth an estimated £11 billion per year in 2030, through reducing the intake of saturated fat, though the authors note that there is considerable uncertainty attached to this estimate. Forster, D., Korkeala, O., Warmington, J., Holland, M. and Smith, A. (2013) Review of the impacts of carbon budget measures on human health and the environment. Report to the Committee on Climate Change. Harwell, Oxfordshire, UK: Ricardo-AEA and EMRC. This entry was posted in Air quality, Energy security, Lifestyle and tagged air quality, climate policy, co-benefits, cycling, diet, health, lifestyle, meat, pollution, transport, walking on 29th January 2014 by Admin. A new study shows that climate action improves energy security, as energy demand declines and low carbon renewable and nuclear energy displaces imported oil and gas. Jessica Jewell of IIASA and her co-authors found that under a baseline scenario, global energy trade soars from 100 exajoules (EJ) per year today to 400 EJ in 2100. Over-reliance on imported energy could expose many countries to risk of supply disruption or price shocks, especially as oil and gas exports will continue to be dominated by a small number of countries. But under a range of low-carbon scenarios energy trade is much lower, varying from 40 to 240 EJ/yr in 2100. This is partly due to lower energy demand, and partly to replacement of imported fossil fuels with locally produced renewable and nuclear energy. In the baseline scenario, the proportion of the global primary energy supply that is traded remains at around 20%, but in the scenarios with unlimited penetration of renewables it falls to as little as 3%. There are interesting differences between the 42 different low carbon scenarios. All are taken from the Global Energy Assessment, and all restrict future temperature rise to 2oC over pre-industrial levels. However, the greatest energy security benefits arise in the scenarios that focus on energy efficiency rather than energy supply. These scenarios see energy demand fall steeply, reducing the need to import energy and making the economy less sensitive to global energy price fluctuations. The lowest energy trade occurs in a high efficiency scenario in which there is a significant switch to electric and hydrogen vehicles, and no restriction on the uptake of renewable or nuclear energy. Interestingly, restrictions on the uptake of carbon capture and storage (CCS) tend to improve energy security, as this forces a move away from fossil fuels. The most striking impacts are seen in global oil trade. Under the baseline, this rises from around 80 EJ/yr today to a staggering 180 EJ in 2100 – a major security risk, given that the transport sector is almost totally dependent on oil. Yet in all the low carbon scenarios, oil trade plummets dramatically to under 10 EJ/yr by 2100. Trade in gas and coal is also lower in the low carbon scenarios than in the baseline, with the exception of a few scenarios where the use of renewables is restricted. Trade in biofuels increases in all scenarios, including the baseline, yet it remains at well under half the volume of oil traded at present. In some scenarios, however, trade in hydrogen becomes comparable with present day oil trade by the end of the century. But both biofuels and hydrogen are exported from a greater range of countries than oil and gas, meaning that supply risks are lower. The exception to this is a few scenarios that restrict nuclear energy, as this limits the number of countries that can generate enough electricity to produce hydrogen, e.g. by electrolysis of seawater. 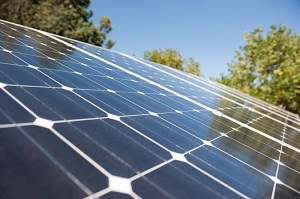 The paper concludes that low carbon scenarios generally lead to lower energy trade and higher energy diversity, especially where the focus is on reducing energy demand, though in some scenarios a high penetration of solar power by the end of the century does reduce the diversity of the electricity supply mix. Areas for future study could include analysis of other aspects of energy security that were not included in the model, such as resource depletion (for oil and gas), ageing infrastructure and spare electricity generation capacity. Energy security under de-carbonization scenarios: An assessment framework and evaluation under different technology and policy choices. Jessica Jewell, Aleh Cherp and Keywan Riahi. Energy Policy. 65 (2014) 743-760. This entry was posted in Energy security and tagged climate policy, co-benefits, energy security, energy trade, oil on 6th January 2014 by Admin. Air quality legislation will fail to keep fine particle pollution within World Health Organisation limits, unless combined with a shift away from fossil fuels and uptake of cleaner cooking stoves in developing countries, a new study concludes. Although pollution control is improving in OECD countries, around 80% of the world’s population are exposed to concentrations of fine particles smaller than 2.5 microns (PM2.5) well above the recommended limit of 10 micrograms per cubic metre (μg/m<sup>3</sup>). Emissions are increasing, due to growing vehicle use in developing countries, plus an increase in the population dependent on traditional solid fuels for cooking and heating. Over 2 billion people, mainly in Asia and sub-Saharan Africa, rely on burning coal, wood, dung or crop waste in smoky open fires or inefficient stoves, causing serious pollution both outdoors and indoors. There are significant health impacts, especially for women and children who spend a long time indoors in badly ventilated houses, close to stoves and fires. In this context, biomass is not a climate-friendly fuel because it is often gathered from unsustainable sources, leading to deforestation. The black carbon in the smoke is also a greenhouse gas, as well as increasing melting of snow and ice through darkening the surface so that it absorbs more heat (the albedo effect). Scientists at IIASA modelled five future scenarios with different policies on air quality, climate change and access to cleaner cooking fuels and stoves (such as gas, biogas, LPG or efficient biomass stoves). They found that if air quality legislation was frozen at 2005 levels (scenario a), pollution would increase by 50% by 2030. Even under current and planned air quality legislation (scenario b), global average fine particle concentrations will increase by 30%, from 26 μg/m<sup>3</sup> in 2005 to 34 μg/m<sup>3</sup> in 2030, well above the recommended limit of 10 μg/m<sup>3</sup>. But emissions of sulphur dioxide, nitrogen oxides and fine particles could be 40% lower than this under a scenario combining planned air quality legislation with action on climate change and access to clean household energy (scenario c). This included global action to limit climate change to 2<sup>o</sup>C, through improved energy efficiency and a shift to clean, low carbon energy, plus policies to provide cleaner cooking stoves for an extra half a million people through subsidies and microfinance. Even this scenario would still leave many people exposed to dangerous pollution levels, with an average global PM2.5 concentration exposure of 26 μg/m<sup>3</sup>. But pollution can be reduced still further by bringing in strict air quality regulation and by policies to introduce universal access to clean cooking fuels and stoves (scenario e). This would mean that pollution levels would be below 35 μg/m<sup>3</sup> everywhere, and more than half of the global population would achieve the safe limit of 10 μg/m<sup>3</sup>. The health benefits would be dramatic – a reduction in disability-adjusted life-years lost from air pollution (DALYs) from around 60 million (scenario a) to under 15 million (scenario e). Climate action also reduces the costs of air quality regulation by about 40%, as the shift away from burning fossil fuels reduces the need for costly end-of-pipe pollution control methods. Energy access policies are very cost-effective, with huge reductions in health impacts achieved for just $3.5 billion per year (in $US 2005) for the partial energy access scenario, and $17 billion per year for the universal access scenario. The paper estimates the combined cost of all policies as around $1400 billion in 2030, though this would be offset by the health benefits including reduced cost of health care, increased productivity and avoided death and illness (not evaluated in the paper). The authors conclude that there are significant synergies between the goals of improving air quality, controlling climate change and providing access to clean cooking fuels, with substantial health benefits that would be enhanced by a combined policy. Rao, S., Pachauri, S., Dentener, F., Kinney, P., Klimont, Z., Riahi, K., Schoepp, W. (2013). Better air for better health: Forging synergies in policies for energy access, climate change and air pollution. Global Environmental Change. DOI: 10.1016/j.gloenvcha.2013.05.003. This entry was posted in Air quality and tagged air quality, climate policy, co-benefits, health, pollution on 10th October 2013 by Admin. A new paper published by the Royal Society demonstrates an extraordinarily wide range of co-benefits from a relatively simple technique: silvopastoral farming (farming with trees). Planting trees on grazing land not only cuts greenhouse gas emissions but also improves animal welfare, reduces air and water pollution, avoids soil erosion, protects biodiversity and can increase the milk yield by a factor of five. The review was produced by Professor Donald Broom at the University of Cambridge, working with co-authors from Mexico and Columbia. It challenges the conventional model of grazing, in which livestock eat only grass, by showing that introducing trees and shrubs to pasture can increase productivity. “Excessive focus on pasture plants for the feeding of farmed ruminants has been a major mistake in almost all parts of the world,” explain the authors. 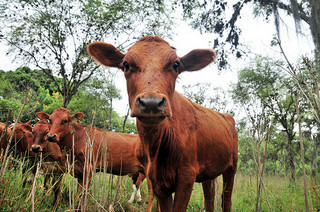 By growing trees and shrubs with edible shoots and leaves, in combination with pasture plants, farmers can produce more fodder per hectare and provide a richer diet for their animals. The greatest benefits come from growing leguminous species, which fix nitrogen from the air. This also avoids the need to apply artificial fertilisers, saving money as well as avoiding air and water pollution. Widely used leguminous “fodder trees” include various species of Leucaena – a drought-tolerant shrub that is loved by cattle and grows fast in tropical conditions. One trial showed that growing Leucaena on pasture increased the mass of fodder available to cattle by 27% and the protein content by 64%. A similar trial showed that milk yield per hectare increased by a factor of four to five, mainly because many more cattle could be kept on each hectare. Trees and shrubs provide valuable habitat for native wildlife. “Conservation need not just involve tiny islands of natural vegetation in a barren world of agriculture, as there can be great increases in biodiversity in farmed areas,” the authors explain. Silvopastoral farms can provide wildlife corridors, connecting the remaining areas of natural habitat. And because milk yield per hectare is higher, there is less need to clear more forests for agriculture, giving further benefits for biodiversity. Climate benefits are significant – through increasing the amount of carbon stored in the soil and vegetation and avoiding deforestation, but also through cutting emissions associated with manufacturing and applying fertilisers. Fertilisers are energy-intensive to produce, and once applied to the land they emit nitrous oxide, which is a greenhouse gas with a warming effect more than 300 times that of carbon dioxide. Trees and shrubs also stabilise the soil, reducing soil erosion. The deep network of roots increases the ability of the soil to absorb and retain water, making the farm less vulnerable to droughts and floods. Soil fertility improves, as the tree roots bring up nutrients from deep in the ground, and recycle them to the land when leaves fall. The paper cites “islands of extra soil fertility under the canopy of trees”, and more favourable conditions for earthworms and beneficial insects such as dung beetles. And farmers gain a free source of wood to harvest for fuel or building, or for sale as an alternative source of income. Perhaps the most surprising benefit is that the cows themselves are happier, exhibiting more settled and less aggressive behaviour. It seems that they like having trees to hide behind – it gives them a sense of security. Trees also provide shade in hot weather and shelter from wind and rain. There is even a reduction in diseases from parasites such as ticks, as the trees attract birds which are natural predators of ticks. These factors make working conditions more pleasant for the farm staff as well, and silvopastoral farms report higher retention of staff and higher job satisfaction. Silvopastoral farming offers the tantalising prospect of genuinely sustainable high-welfare livestock production, and the authors conclude that it should be further developed. This entry was posted in Agriculture and tagged agriculture, biodiversity, climate policy, co-benefits, cows, silvopastoral farming, soil erosion on 25th September 2013 by Admin. A study published in Nature Climate Change estimates that climate policy could save millions of lives every year by cutting air pollution. The health benefits would outweigh the cost of cutting greenhouse gas emissions. 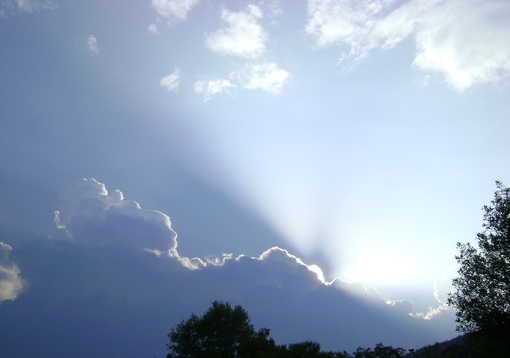 The research team, led by Dr Jason West at the University of North Carolina, used the latest data on the health impacts of fine particle and ozone pollution to model two scenarios: one with strong global action to limit greenhouse gas concentrations to 525ppm by 2100, and one with no climate action. The climate action scenario entailed a shift away from using fossil fuels, which are the main source of air pollution, by cutting energy demand and switching to nuclear and renewable energy (mainly wind) and biofuels. They found that the scenario with strong climate action led to half a million fewer premature deaths from air pollution globally every year by 2030, rising to 1.3 million in 2050 and over 2 million by 2100. The model included the impacts of fine particles on lung cancer and cardiopulmonary disease, and the effect of ozone on respiratory problems. The health benefits are worth between $50 and $380 for every ton of carbon dioxide removed – which is more than the cost of cutting carbon emissions in 2030 and 2050, and within the lower part of the range of cost estimates in 2100. The health benefits were strongest in the densely populated regions of East and South Asia, North America and Europe, especially in highly polluted parts of Asia. In 2030, two thirds of the global benefits occurred in China, and in East Asia the benefits were 10 to 70 times greater than the costs of cutting greenhouse gas emissions. By linking a model of the global atmosphere with a model of energy economics, the team were able to account for a number of factors not included in earlier assessments. They included the effect of long range transport of pollution, the growth in ozone pollution due to methane emissions and the impact of climate change itself on air pollution (such as increased ozone production in hotter, sunnier conditions). They also used a higher monetary value for the loss of a human life in future years, as a result of economic growth, and took account of increasing population and susceptibility to pollution. Together with the use of updated values for the health impacts of air pollution, this resulted in higher estimates of co-benefits than those produced by previous studies. However, the study did not include the health benefits for children and adults under the age of 30, the benefit of avoided illness (rather than premature death) due to air pollution, or the effect of climate policy on indoor air pollution from stoves in developing countries. Inclusion of these effects could result in even higher estimates of the benefits of climate policy for human health. This entry was posted in Air quality and tagged air quality, climate policy, co-benefits, health, pollution on 22nd September 2013 by Admin. Tough climate policy can set us on the path to energy sustainability, by cutting air pollution and improving energy security, a new study concludes. 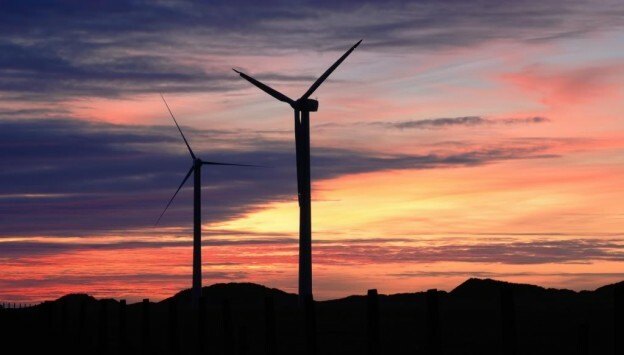 Researchers at the International Institute for Applied Systems Analysis (IIASA) in Austria modelled hundreds of different energy policy scenarios. They found that the scenarios with stringent climate policy produced huge benefits for health and energy security, with big cost savings compared to the other scenarios. Decarbonising the energy system would cut pollution by fine particles and ozone, saving 23 million disability-adjusted life-years worldwide by 2030, compared to a baseline scenario in which all currently planned air quality legislation was enacted. At the same time, energy efficiency improvements and a shift to low-carbon energy (including locally produced renewable energy) would strengthen the energy security of individual countries and regions, by increasing the diversity of the energy mix and reducing dependence on imported fossil fuels. The cost savings are potentially huge: $100-600 billion annually by 2030 in avoided expenditure on air quality control and energy security, which is 0.1-0.7% of global GDP. This would substantially offset the costs of investing in efficient and low-carbon technologies, estimated as up to 1.5% of global GDP. There would be further benefits from avoided health care costs and avoided climate adaptation costs, which were not included in the analysis. The paper concludes that “the common practice of focusing on single issues ignores potentially enormous synergies”, highlighting the need for more holistic policy approaches. Climate policies can help resolve energy security and air pollution challenge, McCollum, David L., Volker Krey, Keywan Riahi, Peter Kolp, Arnulf Grubler, Marek Makowski and Nebojsa Nakicenovic. Climatic Change 119: 479-494. July 2013. This entry was posted in Air quality, Energy security and tagged air quality, climate policy, co-benefits, energy security, health, pollution on 31st July 2013 by Admin.